Times are tough when you’re on the receiving end of a layoff notice. Things might be chaotic in the office, and your direct manager or HR may or may not be able to assist you every step of the way. I created this checklist with that in mind. Please note, however, that this list isn’t all-inclusive and that the chronological order may be different, based on your employer’s protocols. You receive an official layoff notification letter from your manager. 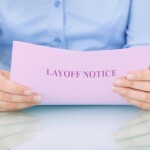 Your manager will explain the reason for the layoff and why you’re part of the selection. Note: Make sure they have your correct address, because that’s where your W2 form and other tax forms will be sent. You should also confirm whether your group health insurance will be terminated on your effective layoff date, or if it will continue until the end of the month. Your exit interview can be conducted either by an HR representative or a hired outplacement group. There you have it, a list of the important things you shouldn’t forget during a layoff. Again, this list isn’t all-inclusive, as there may be benefits and procedures specific to your company or job title.